Book Summary: Two men, each handsome and unusually adept at his chosen work, embodied an element of the great dynamic that characterized America's rush toward the twentieth century. The architect was Daniel Hudson Burnham, the fair's brilliant director of works and the builder of many of the country's most important structures. 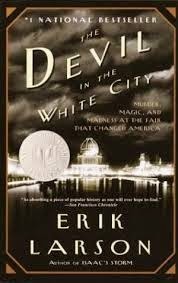 The murderer was Henry H. Holmes, a young doctor who, in a malign parody of the White City, built his "World's Fair Hotel" just west of the fairgrounds - a torture palace complete with dissection table, gas chamber, and 3,000-degree crematorium. What makes the story all the more chilling is that Holmes really lived, walking the grounds of that dream city by the lake. Our Group Review: Kelly D. did such an amazing job moderating this book! She prepared an intriguing powerpoint presentation to help guide us along in our discussion of this book complete with fabulous pictures from the ACTUAL Columbian Exposition (World's Fair) held in Chicago in 1893. It also helped that we were eating "fair" food among the themed decor that completely set the mood for our discussion. 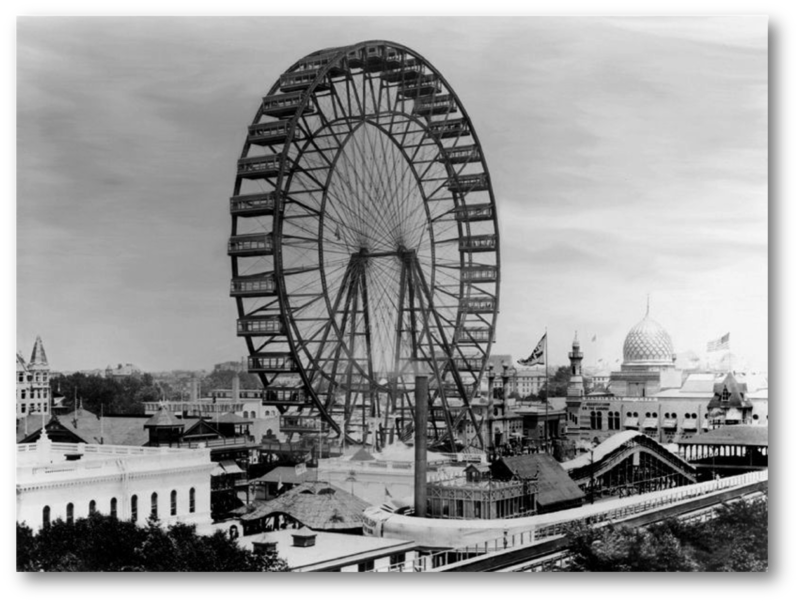 In the late 1880s, Chicago, St Louis, New York, and Washington D.C. all submitted bids to host the 1893 fair but the race was soon narrowed to New York and Chicago. In the end, Chicago won the race to host the fair while also earning it's nickname "The Windy City" for boasting so much big talk during the race. 1 in 4 Americans saw the Columbian Exposition in 1893, Which is astounding when you consider that it was only open for 6 months. More than 26 million visitors would flock to the 600-acre fairgrounds and 200-plus buildings full of art, food, entertainment and technological gadgets. 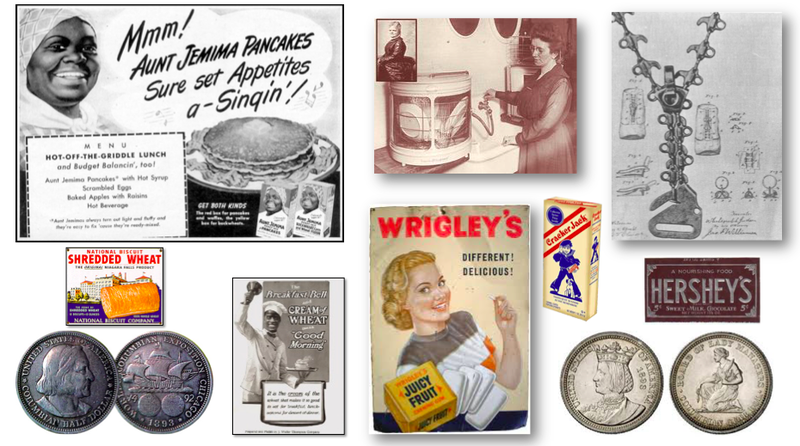 Among the well-loved products that made their debut at the Chicago World’s Fair were: Cream of Wheat, Juicy Fruit gum, brownies, Hershey’s Chocolate, the #2 yellow pencil, Aunt Jemima Pancakes, Shredded Wheat, Cracker Jacks, the zipper, and the world's first “Skyscraper”. Technological advances such as the dishwasher were introduced as were commemorative coins put out by the US Postal Service. A Ferris wheel saved the fair from financial ruin. The Ferris wheel featured 36 enclosed cabins, which hosted weddings and private parties as well as individual passengers. It pulled in over $725,000 over the course of the fair, making it the only profitable element of the whole show. Pittsburgh-based bridge builder, George Washington Gale Ferris Jr.'s "Ferris Wheel"
It was the first exposition to have national pavilions, bring the world to Chicago. The architecture was by far the most astounding element of the exposition, combining the genius of the nations best architects to create the 600 acre fairgrounds with 200+ buildings in UNDER THREE YEARS! As a group, we thoroughly enjoyed discussing the two main characters that the plot is centralized around. 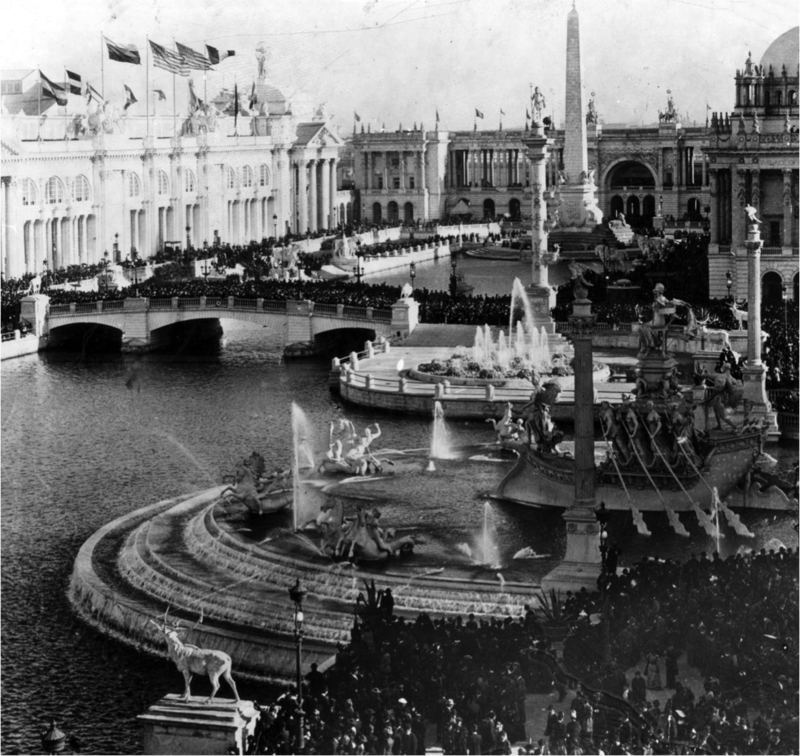 Daniel Burnham- Burnham was lead architect for the World's Fair and was a very talented man. To us it seemed that the fair was more about pride and honor to him than money. He devoted three years of his life to building the fair and even went as far as to move away from his family in the suburbs of Chicago and live on the fairgrounds in what was know as "the shack." Now that is dedication to your craft! Herman Webster Mudgett aka H.H. Holmes- WOW... What a character. First off, we as a group were shocked that we were not familiar with Holmes's story considering its historical significance. 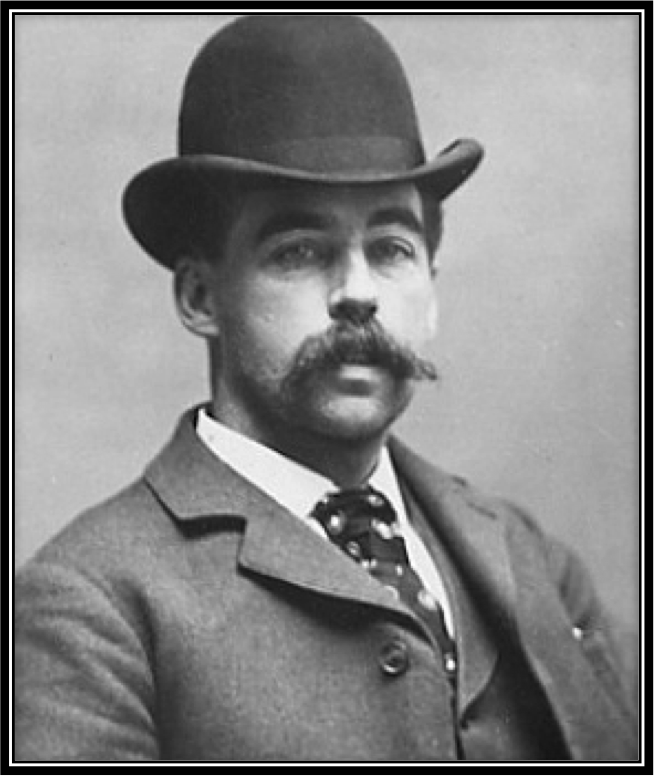 He is considered the worlds first Psychopath serial killer who came just five years after "Jack the Ripper" who seems be who everyone knows even though Holmes killed dozens, possibly HUNDREDS more. Holmes was ahead of his time when it came to his financial schemes and always looking into the future before planning his move to not get caught. Even the construction of his "murder castle" (where he performed his murders) was thought out with extreme care and attention to every detail including a hidden chute down to the basement, an air tight room with a gas pipe leading into it and a human size kiln in the basement. He was extremely charming and manipulative and even though he was thought of as very handsome, we as a group did not find him to be particularly attractive. In our opinion it was his cunning nature and immense charm that won over his victims along with the business of the Chicago fair that allowed him to kill so many without it going noticed. Conclusion- Overall, we as a group thoroughly enjoyed this book although MANY of our members would say that it is not for the faint of heart! There is enough detail about Holmes's murders to give you bad dreams if you pick up this read before hitting the sheets! We felt that it was very informative for a non-fiction book but also very entertaining which is not always the case in this genre and makes for a PERFECT book club book!